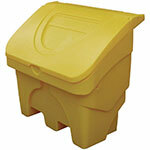 This medium sized grit bin is the solution for efficient winter de-icing for smaller and mid-sized premises. These tough bins are manufactured to withstand the harsh winter elements and are available in a 130 litre capacity. Finished in a vibrant yellow, these grit bins ensure that your roads, paths and steps are keep hazard-free all winter.